We were up before the sun. Monica, our cheerful guide from Avventure Bellissime Tours, greeted us in the lobby of our hotel near Piazza Navona. It was 7 a.m.—dark and early, but not too early for two double espressos to go. After one stop to pick up three additional passengers, we were on our way. 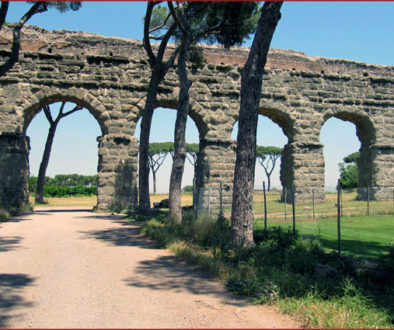 The road out of Rome took us east toward the Apennine Mountains and Tivoli, then south to Amalfi, our first destination. 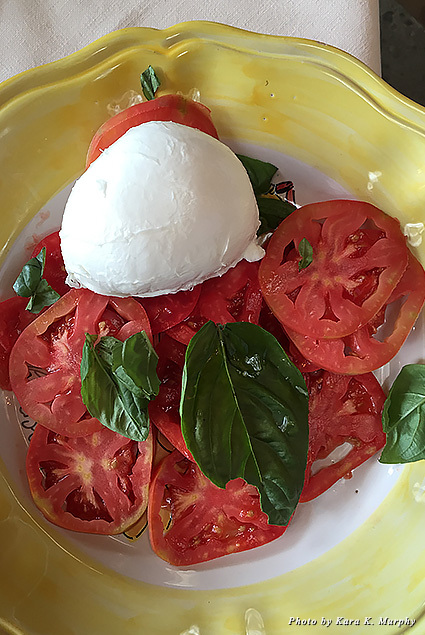 Along the way, Monica shared tidbits of Italian history, pointed out notable landmarks, and answered all of our questions; there weren’t many at that early hour—she was much more awake than we were. As the expressway turned to coastline, the world seemed to open up. We’d left the stone ruins of Rome for gorgeous greenery and bright, colorful buildings that dotted the cliffs, refusing to be diminished even the slightest bit by the overcast day. The Mediterranean Sea swelled below. 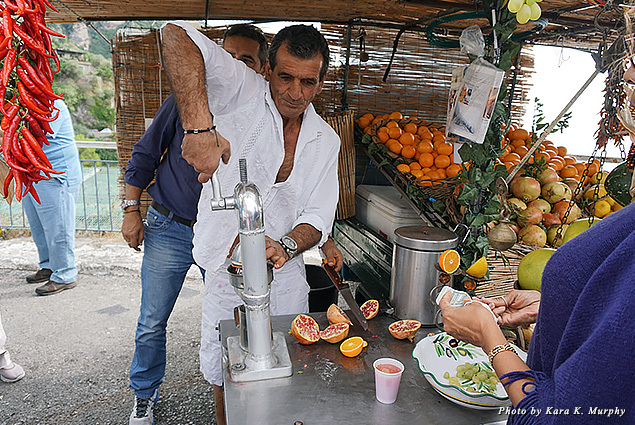 Roberto, our driver, stopped a couple of times for photo ops and fresh-squeezed juice. Pomegranate, orange, or a mix of both, made to order at a roadside stand. Our lungs full of fresh sea air and bellies loaded up with vitamin C and antioxidants, we continued on to Amalfi. We didn’t have a lot of time, just a little more than an hour, so Monica told us exactly where we should go, depending on our interests. We made a beeline for Antichi Sapori d’Amalfi, a limoncello shop that has been making the sweet lemon liquor in small, handmade batches for more than 25 years. Our next stop was the café a few yards down for more espresso and delizia al limone. 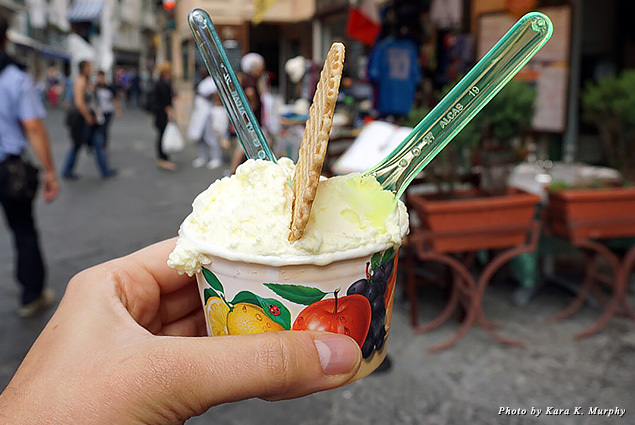 The last item we just had to taste was limoncello gelato; it was tart, sweet, and delicious. Our sugar cravings satisfied (in our defense, we did share! ), we walked the narrow streets for a bit, stopping to buy lovely linen scarves and peruse the hand-painted ceramics the Italian coast is known for. 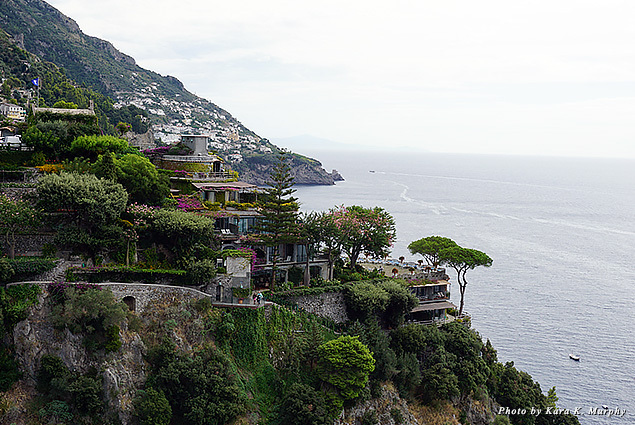 By then, it was time to head to Positano. Reluctantly, we loaded back into the van, and after a 45-minute drive up the 163, we arrived. Again, Monica gave us suggestions about where to go and led us to the place she recommended we have lunch. She told us we of course had the freedom to eat anywhere we liked, and there were many great restaurants, but she highly recommended Chez Black. She hadn’t led us astray so far, so we took her suggestion and were glad we did. 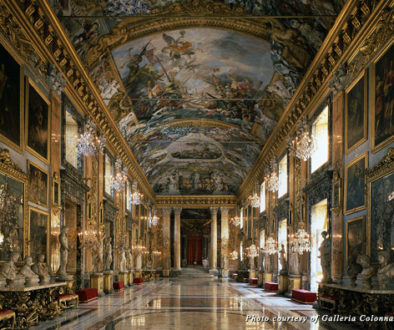 Framed photos of celebrities dining at the open-air restaurant crowded the walls, including one of Denzel Washington, who owns a villa nearby. On the verge of full from our sweets binge, we split a caprese salad and a pesto pasta that was incredible (our waiter got the kitchen to split it into two portions without us even asking). 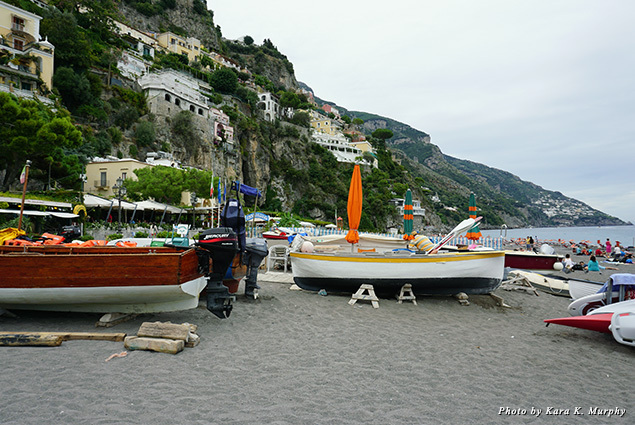 After a quick lunch and a walk on the beach, we explored Positano, a magical, mostly pedestrian-only town. The inclines helped us walk off some of what we’d eaten, and the shops and sidewalk vendors left us having a hard time deciding what to take home. I settled on a ceramic olive oil pourer. With the day only half over, we headed to Pompeii. Gaetano, a third generation local guide who showed Rick Steves himself around the famous ruins 25 years ago, met us at the entrance gates. He expertly told us the story of Pompeii, the ancient Roman city that was buried—and preserved—by volcanic ash from Mount Vesuvius in 79 CE. To give us a robust overview, he showed us the best example of each kind of building, from brothels and spas to houses and wine bars. 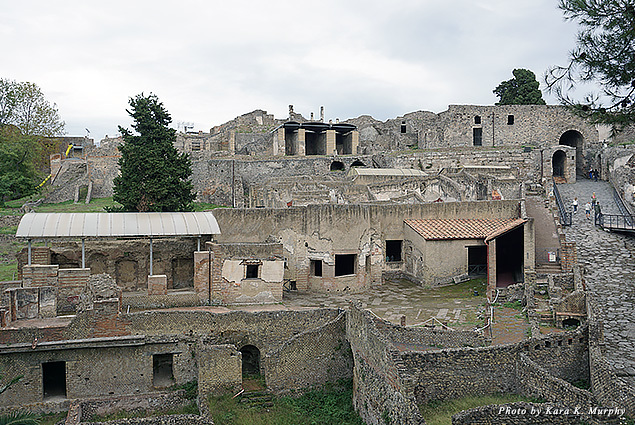 There were also indoor bathrooms, one-way streets, and saunas with central heating in Pompeii. We felt incredibly lucky to experience the ruins with Gaetano. After visiting Pompeii once with a guide and once without, I highly recommend hiring a guide. It’s expansive and very easy to miss things, and there are no placards explaining what you’re seeing. 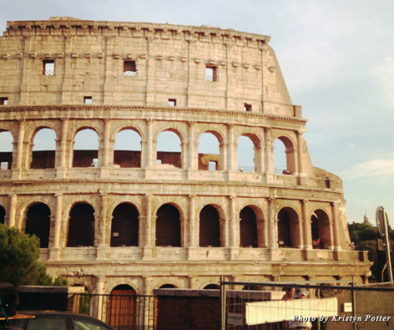 After a captivating tour, it was time to head back to Rome. We were sad to see the day end but ready to crawl into bed. We shopped, we ate, we walked, and we learned many fascinating facts about an ancient city. All in all, it was a perfect day. 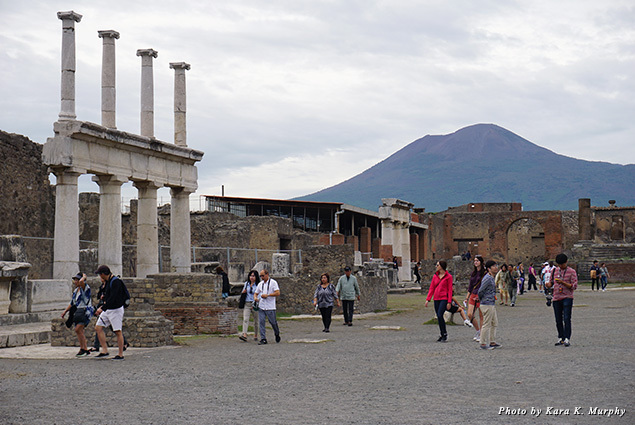 It is possible to do a day trip to the Amalfi Coast and Pompeii on your own (you can take public transit), but if you’re like us and short on time, an organized small group tour is a great bet. We booked this one through Viator.com, a branch of TripAdvisor that vets local tour and activity providers to ensure a memorable experience, and we were so happy we did. With the help of our knowledgeable guides, we were able to see everything we wanted to see, without any added stress or time-wasting detours.